NetherRealm has lifted the veil on Mortal Kombat 11 in a lengthy reveal stream, showcasing new combat systems, new customisation options, and plenty of gorily horrific fatalities. It’s also meant the reveal of the first parts of the roster, and we’ve got plenty of returning favourites – from the obvious picks to heavily demanded comebacks – and some new characters as well. The basics of battle will be familiar if you’ve been playing any of NetherRealm’s recent titles, but there are some significant changes over Mortal Kombat 11. Meters are now split between offence and defence, so you’ve got separate resources for separate types of abilities. X-ray moves have transitioned into Fatal Blows, which become available when your health drops low. Character customisation options will let you change the appearance of your fighters, from full costumes to individual weapons and bits of gear, each of which appear to have slots for stat-altering augments. Oh, and yes, there are fatalities – like one where Baraka rips a face off, rips the front of a skull off, stabs through a brain, and then eats the brain. It is, indeed, Mortal Kombat. 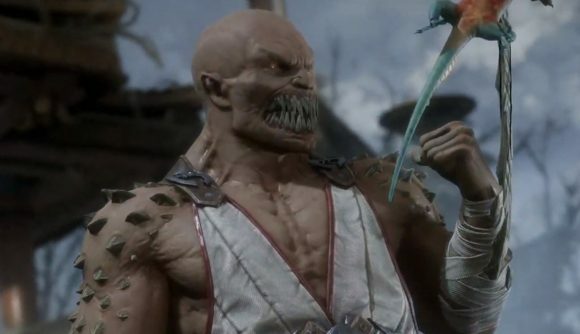 Baraka is probably the highlight of the official roster so far – he appeared only as a non-playable villain in MK11, and he’s been sorely missed by fans. Skarlet’s also coming back after debuting as a DLC character in MK9. We got to see some gameplay of the new fighter Geras, and some story sequences featuring another new character in Kronika – it looks like she’ll be a boss, but we don’t know if she’s playable just yet. Also, those rumours about Ronda Rousey as Sonya Blade were true. Here are the characters confirmed so far. In addition to those, the stream had a couple of additional teasers – notably quick flash of what appeared to be Kabal. Concept art on the pre-stream showed plenty of other characters, including Reptile, but those are much shakier teases. Expect much more info on Mortal Kombat 11 soon, since the game is scheduled to launch on April 23.